When I was a kid, well before the current HGTV home improvement shows like Property Brothers or Love It or List It, there was This Old House with Bob Vila on PBS. I remember being transfixed by the half hour show that would transform homes with the most amazing carpentry projects that Norm Abram would take on as the master carpenter on the program. I had a good friend who I watched the show with who became a carpenter and then a general contractor, and he would always comment about the incredible ways that Norm would approach a project. He simply marveled at the tools that Norm had at his disposal and his ability to use them in creative ways. A number of years ago, I remember reading an article called Paying Attention on Phil Collins Trumpet Matters website. He had summarized ideas from a masterclass that Mark Ridenour from the Chicago Symphony had given mentioning the use of the musician's tools, and specifically the decibel meter in his practice sessions. Concerning private practice, he mentioned the consistent use of the metronome, tuner, decibel meter (for even sustained notes and phrases), and high quality recording devices on which side-by-side comparisons can be made with the best recorded passages. Real improvement came when he became serious about imitating the great players and correcting the areas of need that he heard in his self-recording. And then later that same year, there was another article called The Big Question where Phil Collins again mentioned diligent use of a decibel meter in regular practice. You need your tuner, your metronome, and your decibel meter. Put them on the stand and obey them. Over ninety percent of your work can be prepared with the diligent use of these devices, especially the first two. They will insist that you perfect those basics of the music. The machines will hone rhythm, dynamics and intonation which are musicians' tools. And what good is a musician without his tools?! Early the next year I attended a masterclass with Wayne Bergeron in Arizona and he said something that also stuck with me, and I'm sure I simply filed it away in my subconscious with the recent articles that I had read about the use of the decibel meter in regular practice. The story that really impressed me was when he told about playing a studio date early in his career. It was a multiple day session and he was playing 3rd trumpet (in a section loaded with impeccable players). On the third day, the other players on the job said, you'll be playing the 1st part today. Wayne thought it was probably something that had a lead line that played to his strengths, and when he looked at the part it was a tune called Lonely. There was a brief string intro and then a soft, delicate entrance. During the masterclass, he modeled what he sounded like the first time he played it in the studio: an airball that finally responded in sound. The director stopped him and said, "Let's try that again". Then Wayne thought, "I'll start this a little louder so that it will respond immediately". The director stopped immediately and said, "That needs to be at least a quarter as loud as you just played it". Wayne tried it a third time, and the director said, "Well, that's better but can you play it even softer and with more of a classical sound?” With 80 string players looking right at him at this point he said, "Sure! And then he passed the part to Malcolm McNab!" That got a good laugh! Then he went on to describe the lessons that he began taking with Boyde Hood, Malcolm McNab, and Uan Rasey to address response and soft playing so that he could become a more versatile player. That's what really defines the great players. They're always looking for ways to improve every aspect of their toolkit. He said that Uan was the first person to ever talk with him about the aperture and how it must be like a pin hole when playing extremely softly. As he was describing his lesson to us, Wayne took out his tuning slide and mentioned that he always starts out his playing day on the mouthpiece / leadpipe combination with breath attacks which greatly improved his response and encourages a much smaller aperture. He also commented that once this response is happening the overall character of the sound changes, and if you approach playing in this way, you can move from smaller equipment to larger equipment (mouthpiece) and there will be more overtone content and more colors available to the player. When he played that line from the studio session that had given him troubles years before, it was just impeccable playing! Thinking back to This Old House, Norm Abram had access to every conceivable tool that a carpenter could ever want or need, but he also had the familiarity with each of those tools and used them extremely effectively. Certainly as he grew in skill as a carpenter, he also added many tools to his tool belt. As I searched the web for suggestions about the use of a decibel meter in regular practice, I came up empty (beyond players trying to simply peg the needle!). So, I've been experimenting with how I can use a decibel meter creatively in my own practice, adding a new tool to my toolkit, and wanted to begin a discussion with others who might find this topic interesting. I'm an iPhone user and found an app called Decibel X that can be downloaded for free. I like the layout of the app, with an analog needle in the lower half of the screen and a digital readout of the instantaneous decibel reading and a maximum decibel reading to show the highest peak while playing. There is a window at the top of the screen showing the decibels recorded in the room that moves from right to left in real time to give the shape of the sound, showing a graph of the recorded decibel value versus time as well as a qualitative range such as "Quiet Street" or "Subway". 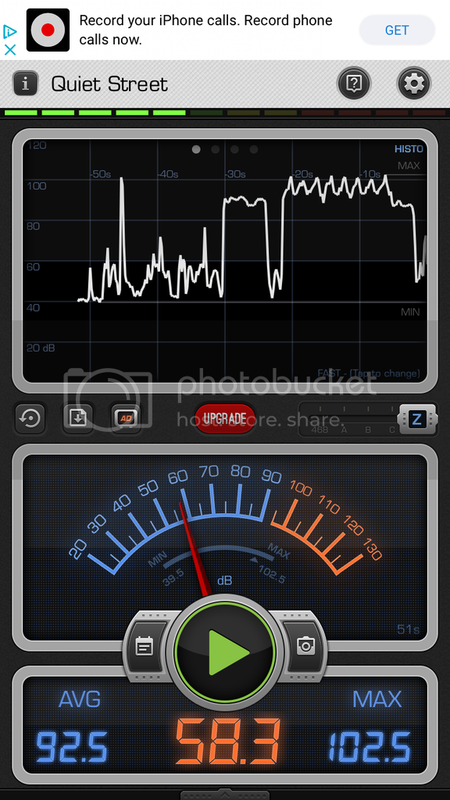 I've found this graph of the recorded decibels to be the most informative aspect of this excellent tool. As you experiment with this app, you will quickly learn that placement of your phone with respect to the bell of the instrument will show similar curve shapes, but with different magnitudes for the absolute dB SPL (decibel sound pressure level values) that are displayed on the screen. So, to standardize the measurements, I've chosen a distance of one yard (36 inches) from my bell to my phone which is sitting on my music stand for each of the recorded examples below. I've chosen very standard exercises that will allow everyone to participate in this project (Major / Minor scale, Irons flexibility study, and Clarke 1). The first example is a one octave Ab Major scale starting on the second space of the staff to just above the staff. I slurred the scale three times with a crescendo while ascending and a decrescendo while descending. After a brief pause I played a one octave Ab minor scale three times in the same octave, articulated, with the crescendo and decrescendo. I recorded these examples in a large bedroom, with tile floors. While I know that room size, type of furniture / flooring, and placement of the bell with respect to the phone can affect the absolute dB SPL readings, I think that the shape of the curve is the more important aspect of this new tool. If the difference between the louder dynamic at the top of the scale and the lower dynamic at the bottom of the scale is at least 10 dB SPL, this represents a doubling of the sound loudness between the lowest note and the highest note. [In past TH discussions on decibels and projection, "research by psycho-acousticians indicates that a 10dB change in sound is perceived as a doubling of sound loudness to humans".] More than a 10dB SPL difference indicates a greater dynamic range. If that 10 dB SPL difference is between 85 dB SPL and 95 dB SPL or 95 dB SPL and 105 dB SPL, it’s still a doubling of the sound loudness. My first recorded example is the Ab Major and minor scale. You'll notice that I hold up a yardstick at the beginning of the video to show that my bell is about 36 inches from the phone on the music stand while I'm playing. While everyone's practice space will be different, we can at least control this one important parameter in the experiment. I plugged my Zoom H2 into a Macbook Pro and used Photobooth to record these examples. I also used the "record" feature on my phone to record the display of the Decibel X app as I was playing, and I snapped a still photo of the plot on Decibel X when I finished playing. It's important to be able to see all aspects of this recording project to understand how to set it up, but ultimately, once you understand how to read the plot, only a still picture will need to be posted to show the picture of your dynamic contrast on any of these standard exercises. There will be lots of bouncing around of the dB SPL readings on the Decibel X app before you play your first note, from the ambient room dB to the shuffling of your feet or tapping the phone when you put it on the metal music stand. For this reason, I played the first note of the exercise as a whole note with a breath articulation to establish the trumpet dynamic in the room. For my first example, this whole note was the horizontal line on the plot at 94 dB SPL. This will allow everyone to understand how to read the plots (i.e. look for the horizontal line around 90 dB as the starting point), and ignore all of the huge shifts in dB SPL within the room prior to playing a note on the trumpet. 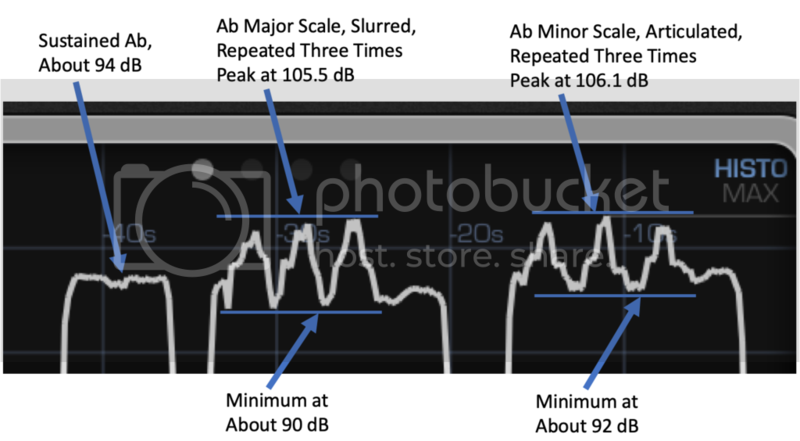 I've zoomed in on the still picture of the Decibel X plot to show what the shape of these two scales looks like. While I’m a good player, I would love to see full time symphony players participate in this topic to see what an ideal picture of these standard exercises look like (MrClean and Peter Bond!). I know many fine players post to TH, and getting a feel for the shape of the dB SPL plot with all types of great sounds would certainly be informative. Here's my example playing Irons Group 9 (repeated 4 times) for the Bb pattern (1st valve). And here's an example of what a G Major scale looks like at 36 inches, and then moving much closer to the phone. Notice that the shape is similar, but just a higher magnitude for the high and low dynamics when I’m closer to the phone. Eventually, based on TH community involvement, best practices will be developed. How consistently can you make the top dB SPL be within a 1 or 2 dB SPL range when playing the scale three times? Once a baseline plot has been established (and posted), how much can you increase the dynamic range (highest note dB SPL – lowest note dB SPL) while keeping a great sound from top to bottom (10dB, 15 dB, 20 dB)? Does the dB SPL shape of your scales change in different registers? When you play different scales, what is your best shape? Can you refine your ability to hear the sound (using the app which will give immediate feedback) and move this best shape to higher and lower scales? The Decibel Meter Tool is simply another set of ears to allow you to be objective in your playing. It might even be a great diagnostic tool to identify a problem area (why do I have a big dip in decibels once I get to a certain point in my range)? What are other examples that should be included in this project? What does a great decrescendo look like on a low note and a high note? What do staccato quarter note Gs at the top of the staff look like for forte, mf, and piano dynamics? I think this could be a really interesting TH topic and get lots of different posters involved. I still think back to the Wayne Bergeron story where the conductor said "that needs to be at least a quarter as loud as you just played it". Using this as a starting point, if a phrase is played at 95 dB SPL as measured on the Decibel X app, 85 dB SPL would be half as loud, and 75 dB SPL would be a quarter as loud. Can you make music at 75 dB SPL with good sound? This is where consistent use of this tool, like a metronome, will allow dynamics to be progressively increased and decreased in the course of our regular practice day. Oh, and I recorded these examples on my Bach Stradivarius Model 37 with a Stork Vacchiano 1 mouthpiece. Cool idea, Derek! I can definitely see how time using a decibel meter like this could help my playing. It feels similar to what I've experienced with TE Tuner's graphs, showing me more clearly what I've done - as opposed to having to watch a single snapshot-in-time and just getting satisfied the moment I see a meter go green on a more traditional tuner. Seeing the historical graph really points out the minor fluctuations and guides my ears to noticing them better on the fly. It seems to me that unless we're actively trying to crescendo/decrescendo, ideally the decibel meter should stay flat even when changing pitches. I know I've heard advice on things like Stamp exercises where the descending line should feel like a crescendo. I'm not there - lots of unevenness - but that's the direction I'm shooting for. Here are my graphs from trying this out this morning (exported through the "Saved List" feature). Clarke 1 F-B with decrescendo at end - you can see where I tried to fade to nothing on the very last note. It gets smoother since I'm not changing notes (and I want to eventually have that smoothness when changing notes too), but ideally the slope would be consistent. I didn't feel like I had great control there, and clearly the result is that it faded slowly at first, then more quickly at the end (maybe I was running out of air). Anyway, cool idea - thanks for the prompt. Looking forward to seeing how this can improve my playing! p.s. Since you're looking to collect stats, I did a bunch of grad school for trumpet awhile back, but now really just playing at home. 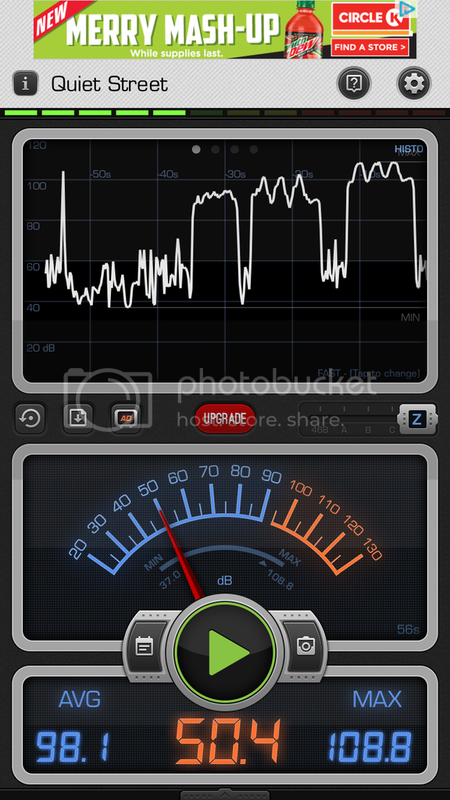 Out of interest, have you done a side by side test of your app against a "proper" decibel meter? I've used a few apps (although not Decibel X) and most of them have not been accurate (the standard of the microphones in phones is not always amazing). Like the idea of being able to plot the readings - when using my regular meter it just gives me the highest level achieved. Without specifying the listener's distance from these sound sources, any claimed SPL (sound pressure level) value is pretty meaningless. Unless the phone app has a very good microphone calibration procedure, the SPL measured by the app is very unlikely to be accurate. And even with calibration, the loudest sounds will never be measured accurately unless you can defeat the compressor algorithm that the phone applies to the microphone signal. Android phones don't give apps access to the microphone compressor parameters; I don't know how iOS handles it. Some phones have directional microphone arrays rather than single omnidirectional microphones, which makes for even more problems measuring SPL. 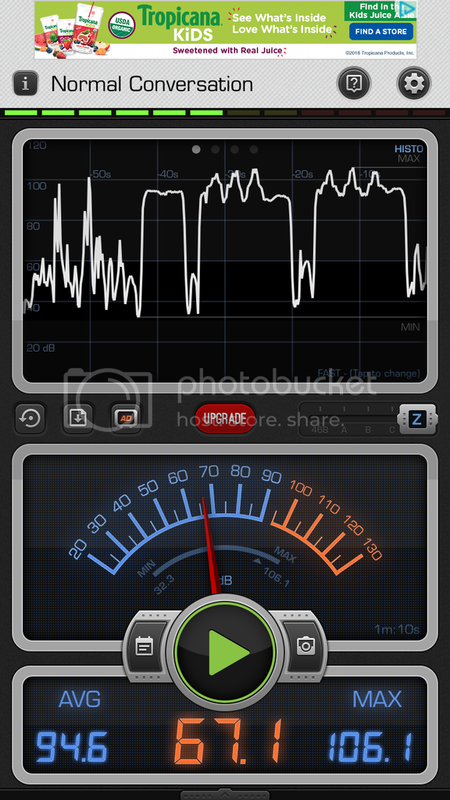 SPL-meter apps are fairly common for phones, but a smart phone is actually a very poor tool for measuring SPL, especially using the built-in microphone. Fancy display and logging features don't mitigate that. The best you can expect is that the SPL-app's level error is reasonably constant, but only within the fairly narrow dynamic range of the microphone and it's processing circuitry and software, which are optimized for voice intelligibility, not accurate measurement. And then there's frequency response and spectral weighting, adding even more sources of error. Seeing the historical graph really points out the minor fluctuations and guides my ears to noticing them better on the fly. This is exactly what I experienced and why I liked the extra set of ears that was scrutinizing my fundamentals. The improved awareness when I play these exercises after seeing the plots gives me improved focus and allows me to be more critical and hold myself to a higher standard. While I can’t get exact dB values from your plot with the Ab scales, it’s simply the impression of the curve that is important, and seeing your starting value in the 90 dB range to peaks well above 100 dB seems to match what I experienced when I recorded these myself. The peaks in your curve were also “pointier” when articulating which is what I saw in my own playing. What I really liked was your Clarke plot with your first repeats in the 80 dB to 90 dB range, and then dropping into the 75 dB to 80 dB range with a final decrescendo down to about 62-65 dB. Wow! That puts you into the Normal Conversation – Quiet Street range for your last sustained note. I have occasionally managed to get into the high 60s dB range when playing in the low register. That’s where this tool can highlight something measurable, like a metronome reading, and allow for progressive exercises to help expand the ability to make music in that range. I appreciate you joining the conversation! Great to see you chime in. I hope all is going well for you. 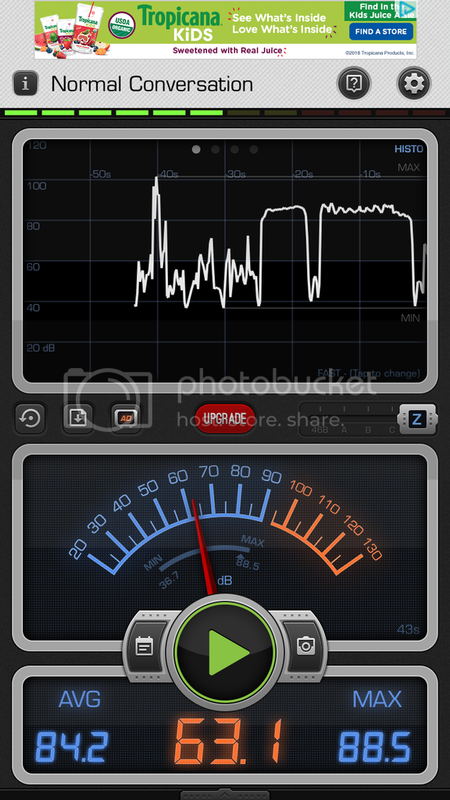 I don’t have a calibrated decibel meter and I’m simply using the app that I downloaded on my phone. While it doesn’t surprise me that the results aren’t accurate compared to a true calibrated device, I’m not really concern with the absolute values. It’s the impression of the curve shape that I think can point out areas for improvement. Then they could download the app and experiment with it in their personal practice for the next week and find out what subtle changes they need to make in their playing to see a crescendo on the app. Modeling this over the course of several months in lessons, with the student using the technology in their personal practice session might get to results a little faster. I’m right with you. I’m sure there are significant limitations with an app like this. But I think that a decibel meter is an “order of magnitude” kind of tool anyway, and accuracy / precision is not necessarily what we need to find a benefit from using the app. The impression of the curve is the important information being provided, and it might give feedback to the player that can inform their ears in a way that is not possible without the app. What do you think after trying the app in your personal practice? Helpful? Not helpful? What do you think after trying the app in your personal practice? Helpful? Not helpful? I've never tried it with a phone app, but some years back I tried playing with an industrial SPL meter. I started with Caruso's Six Notes. I found that "chasing the needle" for SPL was as unhelpful as "chasing the needle" of a tuner for pitch. Since the SPL meter didn't have a logging function, I switched to using a calibrated audio data acquisition and analysis system to record the Six Notes, in a controlled environment (an anechoic chamber at work) with a calibrated instrumentation microphone (B&K Type 4192). Then I could do the analysis after the fact. It was interesting, and I found that the exercise helped me to produce long tones with only minimal variations in SPL. In the long run, it was difficult to make it a regular thing; I don't have an anechoic chamber or an audio acquisition and analysis system at home, and I don't work at that job any more. It was an interesting one-off experiment, and it may have improved my control of SPL. It sounds like you set up an impressive experiment to measure the SPL from your horn, but that the feedback was delayed until after your practice session. What I really like about the phone app is the immediate visual representation that is available through the graph / plot of the relative loudness of my sound on a given exercise. If the curve has a shape that I expect, I feel confident that what I heard from behind the bell was in-line with what gets out into the hall. But, if the curve has a strange dip at a point in the scale that I wouldn’t expect, this will allow me to think about the quality of the sound I heard from behind the bell that was subtly different from the previous successful exercise. And it will allow me to scrutinize the way that I’m hearing my sound. I’ll do some troubleshooting to see if I’m playing a little too loud, and play the same exercise again backing off to see what happens. Many times this simple feedback allows me to correct a tendency in my playing that I know about, but I may not hear immediately. That’s something that I really like about the app. Several weeks ago, I was playing scales with this app on and my Wife was in the room next to where I was practicing running the vacuum cleaner. The typical ambient SPL range when I’m not playing is between 35-45 dB, and my scales are between 95-105 dB give or take a little. When I finished the scale, with the familiar sinusoidal shape, and stopped playing, the app dropped to about 80 dB, not the familiar 35-45 dB because the vacuum was pretty loud. This vacuum sound didn’t change the shape of the curve for my scale in any way. I think you should try the app just to get an impression of the immediate feedback that is available for the relative loudness of your sound, regardless of what the accuracy of the values may be. I think it’s close enough to be an informative tool. Let me know what you think. My understanding is that the iPhone apps are pretty good - the developers have only a small number of microphones to deal with. On the other hand, there are so many variations of android phone hardware that I find it hard to imagine that SPL meters for Android are any good at all. A search on amazon turned up a couple hardware SPL meters which included bluetooth to transmit live data to an app. This would be the best of both worlds - a dedicated hardware mic plus the history graph like those posted above. Unfortunately I can't find any with reviews of any kind, and the price point ($25) makes me wonder, "how good can it be?" Years ago I used a little handheld dB meter from RadioShack in my practice. I don’t think I stuck with it very long though. I’ll concur with the observation that trying to keep the needle steady was as useless for me as doing the same with a tuner. If my thinking drifts from sound, it becomes meaningless. It was also unwieldy since you had to preset a 10 dB range first. Some kind of graphed log coupled with a recording might be useful though. The one thing that I remember is how much pitch level impacted the dBs. A second line g at forte would register about the same volume as a top of the staff g at piano. Another handy tool that I’ve used is auto tune. I’ll record myself, copy the recording to another track and then auto tune just one track. Even though equal temperament isn’t always ideal, it can make you painfully aware of tuning tendencies.